We want to know why you love your CrossFit coach, affiliate or garage gym. The desire to improve and seek perfection drives CrossFit. Virtuosity is the soul of the program, and it’s pursued every day by trainers and athletes who work together to create health and performance—true fitness. In celebration of this pursuit, we want to hear why you love your CrossFit coach, your affiliate or your garage crew. Tell us your story, and we’ll select one per month for publication in the CrossFit Journal. 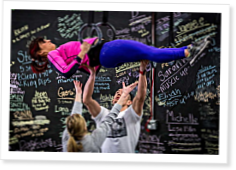 In thanks, we’ll pay the author US$500 and send his or her affiliate or garage gym a $500 gift card from Rogue Fitness. We expect a large volume of submissions, so make yours stand out by pursuing virtuosity in writing and photography. When he wrote the first issues of the CrossFit Journal, CrossFit Founder and CEO Greg Glassman strained over every line, which is why his articles stand up 12 years later and define the methodology. That’s the approach needed to get your words into the publication Glassman started in 2002. Strive for excellence—which is a nice way of saying a great story can be ruined by a careless pen. Review the submission guidelines below and send in your articles and photos. Submissions that do not conform to the submission guidelines will not be considered. Due to the large volume of submissions, we cannot respond to each email or requests for feedback. Only authors selected for publication will be contacted. 1. Articles must be original, unpublished works. Authors of selected submissions will be supplied with legal documents to be filled out prior to publication. 2. Articles must be submitted in Word documents attached to an email. Documents should not contain bolding, italics or other formatting. Please submit in Arial font. 3. Articles can be 500 words maximum. A. Photos must be original and owned by the person submitting. Photos taken by others may be submitted provided the owner has given permission. B. Photos must be in focus, well lit and free of watermarks. Minimum file size is 1 MB. Please review your camera’s settings to ensure you are shooting high-resolution images. Cell-phone photos and thumbnails are not accepted. C. Photos must be attached to the email as JPEG files. Do not embed files in Word documents. Photo file names should list both the name of the subject and the name of the photographer in this format: SubjectName-PhotographerName.jpg. Examples: JohnSmith-Jane Doe.jpg or CrossFitAnyTown-JimJohnson.jpg. Virtuosity@crossfit.com is now open for submissions. Tell us why you train where you train, and do it uncommonly well. Mike Warkentin asks what happens when hard-charging CrossFitters run into gym socialites looking for a conversation. CrossFit is changing gym culture—that’s obvious. Thank God for this. I'm gonna get on it! Virtuosity@crossfit.com is an email address, not a website. My pro photog shot high-def portrait quality pix that nonetheless say they are only 124KB. Advice? Never mind, I just found out I just had to "download original" to get the 4.6 MB version! I noticed in the directions it doesn't really say how long this is open. I submitted an article a few weeks ago and I haven't heard anything about it. It might not have gotten chosen, which is fine. I was just wondering if there was a date when this was over.